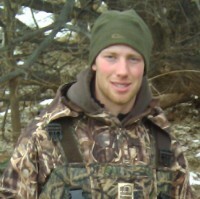 I grew up in northwestern Wisconsin and was introduced to hunting by my father, at only age 5. This was the beginning of my life long passion for hunting ducks and geese. As a kid I also hunted small game, turkeys, deer, and predators. As I got older, my love for waterfowl hunting became an obsession which still holds strong today. 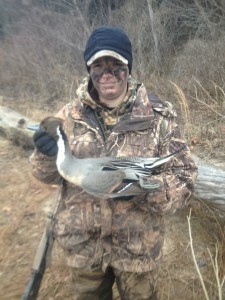 I was hooked immediately upon my first harvested goose. During the past 30 years of hunting and guiding, I have developed a great appreciation of the outdoors, and all the hunting opportunities that Wisconsin and the great Midwest has to offer. I now take pride in my abilities as a hunter and guide to call and decoy wary ducks and geese into the closest shotgun ranges possible. 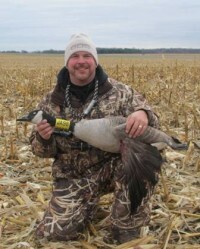 I am honored to be a guide with Goose and Duck Smackers Guide Service and Pro Staffer for Calef Calls. I enjoy the company of fellow hunters and the stories and memories in which they share. I look forward to providing others with many more hunting memories and experiences from the outdoors to pass along to family and friends. Hi my name is Kassie. I grew up in central minnesota. I started hunting deer with my dad and uncles. After I met my f1ance I started goose and duck hunting. We moved to Oklahoma where we continued our passion for waterfowl hunting. In the next couple years I look forward to getting the next generation involved in the outdoors with my 2 boys. Hey my name is Justin. I grew up learning to chase ducks and geese in central Minnesota with my dad uncles and cousins. From a young age I would look forward to fall and hunting season. My passion of chasing waterfowl has taken me from one side of the country to other. I have traveled from North Dakota and Minnesota to moving south to chase ducks in Oklahoma and Texas. Now as father of 2 boys I look forward to passing this passion on to them. Hi, My name is Raelin Setrum. At a very young age my love for hunting began in the car seat in my dad’s truck while blowing a call. I’ve have been hunting the Marsh Lake area of Minnesota along with other local spots since I was five years old I wanted to be just like my dad when he would go hunting. I wanted to be in the pictures holding the birds and cleaning the ducks and geese. I also always enjoyed helping cook the days harvest of birds for supper. My passion for the sport escalated when I was finally able to shoot my own gun. 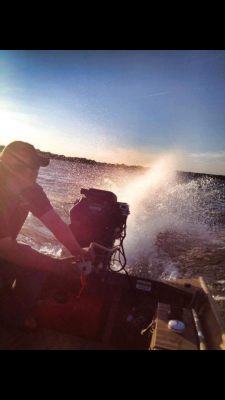 My uncle and I would compete to see who could get their limit the fastest. "I definitely won the majority of the time." Hunting has been a big part of my life for a very long time and I am looking forward to more exciting adventures yet to come. My passion for waterfowl hunting started at the young age of 9 when I began hunting with my dad and his friends for ducks and geese in Minnesota. Over the years my enthusiasm for the sport has continued to grow and has blessed me with many great opportunities hunting all types of waterfowl from Canada to Oklahoma, Arkansas and every state in between, all while meeting many great friends along the way. My pursuit for waterfowl runs from September- April every year following the birds on their migrations south and north again. I have also been a professional waterfowl guide for the last 5 years being fortunate enough to enjoy countless memories a field with many different people. What I like most about waterfowl hunting is the great camaraderie in the blind, watching the world come alive every morning, and of course making the birds respond to a call.